Academics > Academic Term > Courses is where you add the course instances for which your students will register, your faculty will create assignments and record grades (among other things! ), and your billing office will charge tuition and fees. It's also a record of the courses your school has offered together with some basic enrollment statistics. Keep reading for some basic info about course instances, or jump down to the instructions for adding courses. Catalog courses are "templates" for course instances. They contain the information shared in common by all instances of that course (more or less)—abbreviation, description, program, level (Grad, Undergrad), credits/hours, and so forth. Course instances are courses as they exist within a particular academic term. They have particular meeting times, assignments, student roster, section number, etc., unique from other instances of that same course. Who can access a course instance? Read and edit every aspect of a course instance—assignments, grades, comments, etc. The faculty and teaching assistants assigned to the course can read and edit every aspect of a course instance save for some of the catalog information shown on the Course > Info view. Students can view information, participate in assignments, discussions, tests, etc., and post to the bulletin board. Any Populi user (save for Library Patrons) can view basic information about a course—info, meeting times, assignments, etc. As soon as academic years and terms have been created, you can start populating them with course instances. The Registrar creates and schedules the course instance (see below). The assigned faculty add content to it. Students are registered in the course. At the end of the term, the course is finalized: the grades are submitted to the registrar, and the various records (transcripts, degree audits, etc.) are updated. Select the term to which you wish to add the course from the term selector. 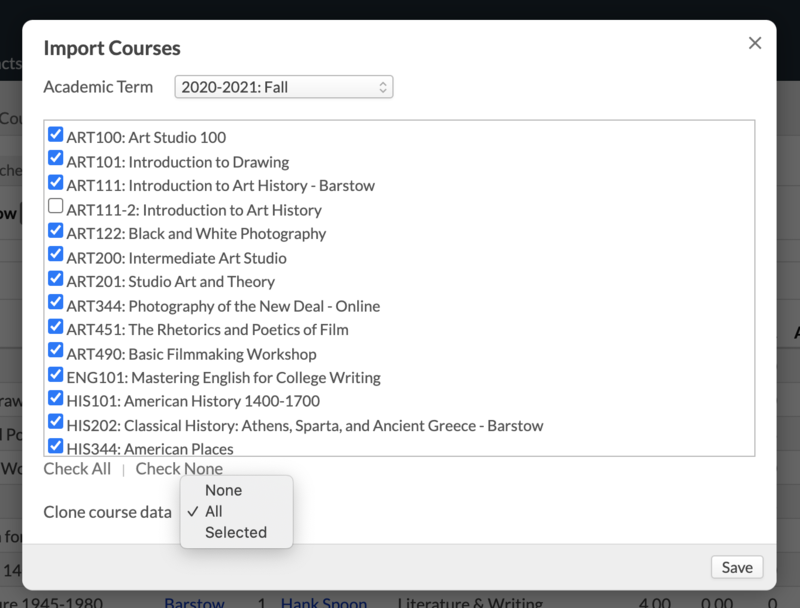 Click Add Course(s) and select Add a course. Select the department and then the course. Populi supplies a section number; if need be, change it. Courses inherit start/end dates from the term. If you wish to change these, type new start/end dates (these don't necessarily have to fall within the term). Start/end dates confine student activity in the course to the time between those dates. Students cannot interact with course materials before the start date nor after the end date. 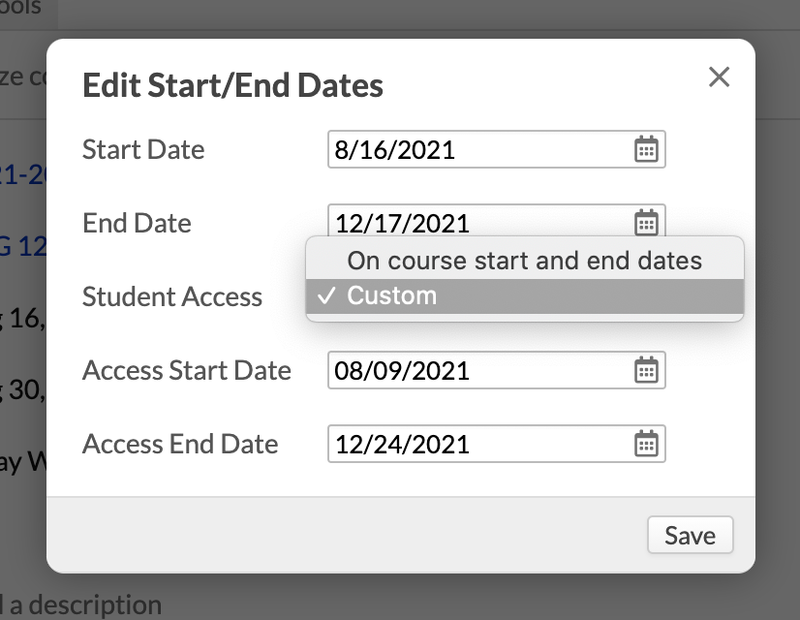 If you wish to allow student access before the start date, you can change the Student Access date by editing the start/end dates after you've set up the course. Choose a campus (if you have more than one). Among other things, this ensures that only students who attend at that campus can register for that course. Check if the course is open to students. This lets them see assignments, etc. before the course start date. To hide these items from students (say, while the professor is building the course), uncheck the box. Check the day(s) on which a given meeting time will occur. Give it a name, if necessary (e.g. Lecture, Lab Work, etc.). Enter the From and To times. Enter how often a meeting time repeats—every week, every 3 weeks, etc. Select the building and room from the drop-downs. Click Add Meeting. The meeting time will list in the box below. You can then repeat these steps to add other meeting times, or move on to the next step. Check if you wish to send an email to the course's faculty, teaching assistants, and students if any part of the schedule changes. If everything looks hunky-dory, click Add Course Instance. Click Add Course(s) and select Import courses from another term. Check the courses you wish to import. Check if you wish to clone all course content also (assignments, tests, etc.). This does not import any meeting times, due dates, etc. Repeat these steps if you want to import courses from another term. You can enter and adjust other details on the Course > Info view. Course faculty and teaching assistants can start filling up the courses with content. You can start registering students and auditors. Two settings on the Course > Infor view affect when (and whether) students can access the course—that is, view and interact with the course materials and content. Student Access is a sub-setting under Start/End dates. It lets you make course materials available to students before the course start date. This only affects whether students can access the course; start/end dates on transcripts, etc. will not be affected. Next to Student Access, select Before course start date. Enter the date at which you'd like students to be able to access the course. The Published setting is available to Academic Admins, Registrars, and course Faculty. It determines whether or not your students can see course content. This can help prevent over-eager students from, for instance, buying the wrong books ahead of time after looking at a "work-in-progress" reading list. When a course is Published, they have full access to it. When it is not, they'll only be able to see the course name, description, pass/fail status, credits/hours, faculty, and meeting times. Wherever you see its name or abbreviation (transcripts, degree audits, faculty pages, a dozen other places...), click it and you'll go to the Course > Bulletin Board. In the course catalog, you can find every instance of a particular course under the Course Instances heading of any catalog course. You can find any in-session course by typing the name or abbreviation in Search. How do you designate if a course is online or in an arranged format? Do you just leave it with no meeting time? I'm not exactly sure what you mean by "arranged format", but I'm guessing you mean something like "delivery method". At this time, we don't have "delivery method" set up as a course variable, but that is something we have planned for a future release. Many of our current customers use Campuses to designate delivery method (a lot of them have an "online" campus)—an admittedly-imperfect workaround. The course doesn't have a scheduled time. On our written schedule, it is designated as online or ARR. If I just leave these courses with no meeting time, will it still be listed as a course for the semester. Oh, yeah, it sure will. Course instances need two things to exist: a Catalog Course abbreviation (like ENG101), and placement in an Academic Term. So, if you add any course to an Academic Term, it will show in the Courses Table. All the other information—instructor, schedule, etc.—are totally optional. What do I need to do to delete a file on the INFO page, so I can replace it with a revised file? In the past, I was able to hover over the old file and it would give me an option to delete; but now when I do that, nothing happens. Is there a way to set all courses for the same term to have student access to the course at the same date? it is a little tedious having to do this one by one.